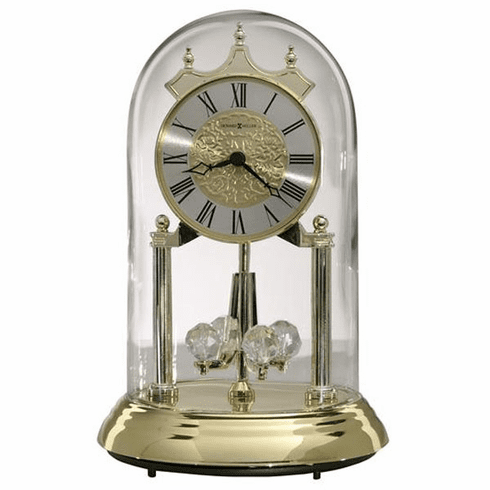 Polished brass finished 9" glass-domed anniversary clock with metal base and triple crown finial. A two-toned satin brass dial features a circular spun silver, numeral ring with raised, embossed center design and black Roman numerals, surrounded by a brass-tone bezel. Black, open fret cut diamond hour and minute hands. The direct-drive pendulum includes four revolving synthetic crystals. Quartz movement includes 3 "AA" batteries.